This Friday brings us the final installment of our read through of a Lord Dunsany short story collection, A Dreamer’s Tales. My friends Bill Ward and C.S.E. Cooney have joined me once again to share thoughts and look back on what we’ve read. Unfortunately, Claire was fending off a horde of Gibbelins this week, and had only time to drop by for a few moments. Hardboiled Monday will return next week. For now, here is “Icicles,” a great and little known cut from Badfinger, off of their fourth album. This Friday brings us the fifth installment of our read through of a Lord Dunsany short story collection, A Dreamer’s Tales. My friends Bill Ward and C.S.E. Cooney have joined me once again to share thoughts. You can join in too — this book’s stories not only are quite short, they’re freely available as a Kindle download or through Project Gutenberg. It won’t take very long to catch up if you haven’t read them yet, so you might want to do so before you read any further. This week we tackled the three final stories of the collection, “The Field,” “The Day of the Poll,” and “The Unhappy Body.” We have a pretty simple review scale. One star is a standout and two stars is truly great. As with preceding Hardboiled Mondays, Chris Hocking and I are working our way down the master list in alphabetical order. Details and the list are here. And earlier discussions are here. Today we’re looking at James Crumley’s The Last Good Kiss. I’ve been dispatched down the river Yann on a secret mission, so our re-read of A Dreamer’s Tales will have to conclude NEXT Friday. For now, here are two items of interest. First, one of the greatest sword-and-sorcery writers of the ’70s (and one that by all rights should be a household name) has a new book out. Charles Saunders’ newest novel has been covered in glowing detail by Fletcher Vredenburgh at Black Gate. Go check out the review, and buy the book. Second, if you’re any kind of fan of Barbarian Prince you need to look into a phone app titled The Road of Kings, which was very clearly inspired by the old board game and is great fun, so long as you keep in mind the game experience it’s trying to emulate. I’ll write a longer review, probably at Black Gate, when I get back from my sojourn on the Yann. If you’ve spent much time on the Black Gate website you’ve probably seen Barbarian Prince get mentioned at least once. 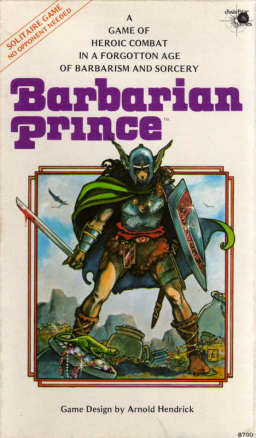 A solo board game from the ’80s designed by Arnold Hendrick, Barbarian Prince is a little like one of those old “choose your own” adventure books, except that the order of events is far more random, for they’re generated by rolling on a number of tables depending upon your location on the map and are partly affected by choices you have made and gear and allies you may have accumulated in your travels. It never plays the same way twice, and a lot of us find it glorious fun — although it is difficult to win. John O’Neill is a huge fan of the game, and he got me interested some years back when he gave me an extra copy he had lying around. When I heard rumors of an unofficial redesign over at BoardGameGeek, I dropped by to take a look and was incredibly impressed. Someone — Todd Sanders, as it turns out — had gotten permission to create a new game board, pieces, and redesign the layout of the rule and event books. The result was brilliant, beautiful, and a completely professional product. It’s available, free, for anyone who wants to download the files and create their own version of the game (the original version of Barbarian Prince is also available for free download, courtesy of Reaper Miniatures and Dwarfstar Games). I contacted Todd to learn more about his redesign and what had inspired it, and discovered he was responsible for a number of stunning games of his own creation. We talked about game design, Print and Play games, and, naturally, Barbarian Prince. Larger versions of the lovely game boards can be seen by clicking on their pictures. Note: This article is reposted from the Black Gate web site, where it appeared in 2012. Hardboiled Monday is temporarily on hold today so I can get all nearby reader attention to come to the Evansville, IN North Park Library on Wed. Nov. 12th! My good friend and fellow writer Mark Rigney will be holding forth with me starting at 6:30, talking about all things books: craft, genres, publishing, the whole enchilada. Yes, we’ll have books to purchase, but the emphasis will be on a seminar-style chat. Questions will be welcome! And YOU, yes YOU, are welcome to attend! This Friday brings us the fourth installment of our read through of a Lord Dunsany short story collection, A Dreamer’s Tales. My friends Bill Ward and C.S.E. Cooney have joined me once again to share thoughts. You can join in too — this book’s stories not only are quite short, they’re freely available as a Kindle download or through Project Gutenberg. It won’t take very long to catch up if you haven’t read them yet, so you might want to do so before you read any further. This week we tackled only two stories, “Carcassonne” and “In Zaccarath.” We have a pretty simple review scale. One star is a standout and two stars is truly great. This being NaNoWriMo I should probably be writing helpful posts about my own revising process… but the fact of the matter is I kind of have my hands so full with revising right now I just don’t have the time. Perhaps that sort of advice will come in handy next month, when so many people have most or large portions of brand new novels written. In any case, today I’m just going to post some links. First, for all of you writers out there, here’s some depressing news, although most of you probably already knew it. Second, a wonderful letter from Sam Sykes to GrimDark fantasy you definitely need to read. Finally, some writing advice from the talented, award-winning, indefatigable Mary Robinette Kowal. Today we’re looking at one of the book series by famed mystery and suspense writer Max Allan Collins, Quarry.